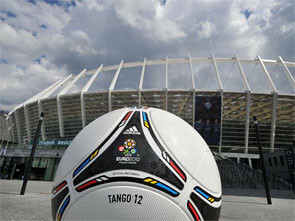 Final EURO 2012 is coming. Four favourites. Four strong teams fighting to become true champions. Spain, Portugal, Italy and Germany. All of them have enough power to reach the final and conquer for the trophy on 1 July, the Olympic Stadium, Kiev. Let’s find out the pros and cons of every team to make the best decision with the most favourable online betting odds provided. Portugal is a team of perfect tactics. Its players obey all smart decisions of their experienced coach. Await for well-organised defence as well as sneak attack. The key players are Real Madrid footballers that can lead the whole team to so desired victory. And of course, we should mention about Cristiano Ronaldo, world’s best player till now. He can determine the match result on his own. Yeah, he has enough power to be a fantastic player to end a match with a crucial goal. Star team. Definitely. Almost all players play for Barcelona and Real Madrid. Professional players to control ball perfectly and achieve high speed to appear near the rival’s gates in no time. Spain is the team of individualities. The team of remarkable personalities to make the whole game a real show. Headed by wise and experienced Vicente del Bosque, Spain has already won Euro 2008 and World Cup Championship 2010. With a win-win mentality this team has no other way, but to get the top of Europe. High quality. These words suit German team perfectly. Persistent, consistent and confident. Germany always shows stable games. Strong defence as well as powerful attacks allow the team to achieve their aims without too much fuss on the field. Good physical shape is the key factor allowing this team to win EURO 2012. Playing steadily during the whole match, Germans tend to perform the decisive steps in the end. More power added, more chances to win got. Smart football. Interesting decisions of Italian coach, Cesare Prandelli. Well, that can be the best epithets for Italy football play. Italy has already shown during this championship that it can fight to death with such monsters as Spain (1:1) and even can defeat such strong rivals as England. Of course, the penalties performed but still Italy won that fight (4:2). Well-balanced. With new players as well as experienced footballers, Italy shows a perfect combinations of smart quick decisions and cautious play. No weak points to highlight. The main favourites are Spain and Germany. However, they both still need to win semi-final EURO 2012 matches fighting with powerful rivals that also deserve the title of EURO Cup winners.